I have started buying more and more products from my amazing fellow SLPs at Teachers Pay Teachers (If you don’t know what TpT is…you better head over there as soon as you are done here and check it out!) 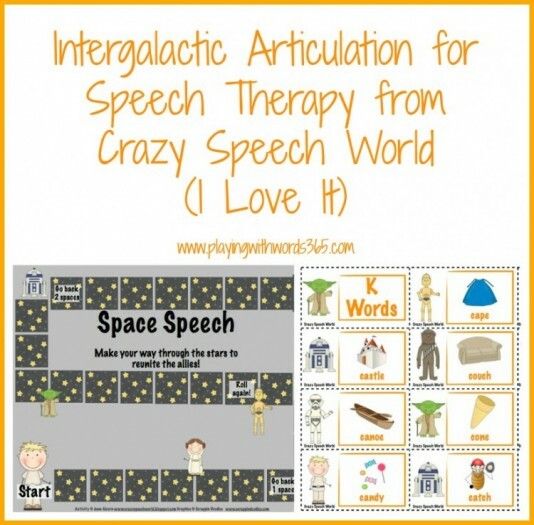 I recently just purchased and used a pretty awesome game called Intergalactic Articulation for Speech Therapy from Jenn over at Crazy Speech World. And I love it. It is a Star Wars Themed (see why it rocks already?) 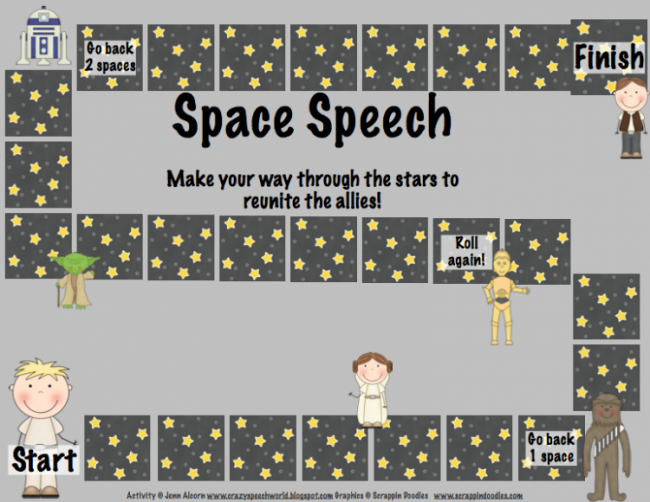 articulation card game with a Star Wars themed board game that targets /f, k, g, p, b, m, t, d/ in all positions of words. You get sets of cards that look like the ones below. So here is the cool thing…you can use the cards WITH the game board OR you can use the cards with another game you are playing. I used the cards with two other “normal” kid games (affiliate links ->Chickyboom and Five Little Monkeys Jumping On The Bed ). BUT…I then left the board game with my client to use as HOMEWORK. So with the client I played this game with, I used the blank cards to write sentences on. I wrote sentences like “I can see…” “The cat has a….” “I like the…” and so on. So I could keep track of those cards, I drew an X on the back of them all, and then when playing, the child needed to pick one card from that pile and one from the word pile, and then put them together to form a sentence. Then I had the child say the sentence two times. What makes this even more fun, is that sometimes the sentences won’t make any sense at ALL. And this is the fun part! Silly sentences make kids giggle and they motivate them to want to make more silly sentences. So they were even more motivating! 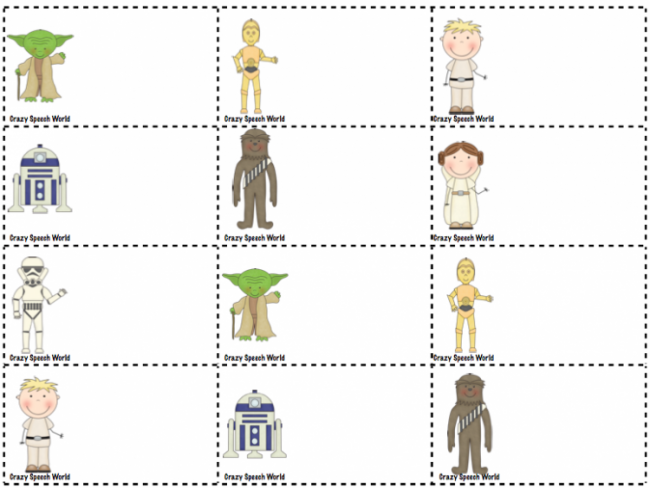 One last tip…each card has a Star Wars character on them. My client LOVED seeing which two characters he would get on each turn. A couple times he got matching characters. I think next time I play I will make it so that when you get the same character, you get an extra turn at the game! Where Can You Get This Awesome Game? Do you have any favorite products from TpT? I’d love to hear about them! Thank you Katie! I am so glad that your little guy liked this and I hope it helps him get motivated to make lots of progress!! !